Last month, Heavy Metal magazine announced it would be bringing color versions of Jack Kirby’s iconic Lord of Light (and later Operation Argo) art to print the very first time. Before that happens though, io9 is proud to reveal some of the images — as well as how you can get your hands on prints of it at SDCC this year. 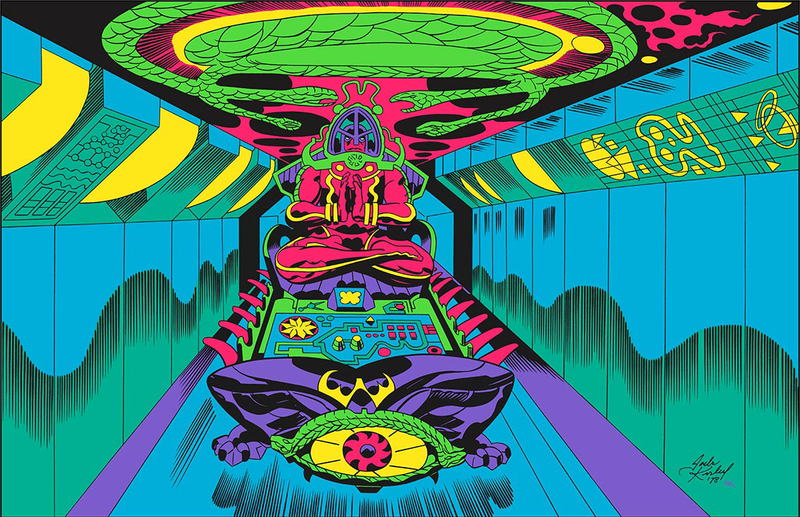 Kirby’s art isn’t just fantastically weird and grand — it has an important place in history as part of the 1979 Operation Argo (which you might be familiar with from the recent Oscar-winning movie). Originally drawn as work for Barry Ira Geller’s planned film (and theme park) adaptation of the Roger Zelazny novel Lord of Light, the art was ultimately used as part of a CIA mission to extract hostages from the American embassy in Iran as concept art for a fake movie, Argo. The fake production was used to allow CIA agents to infiltrate the country undetected. And so I told Ray Bradbury, one of my consultants to Science Fiction Land in 1979, ‘Imagination married to Reality Creates the Future.’ That is my highest belief. Science fiction is the greatest imaginative medium invented.” And I told Jack Kirby — and he agreed — just like Buddha who came 2500 hundred years ago and changed the awareness landscape of the world, in 30 years, Technology and Science Fiction with become Scientific Technology and will have changed the consciousness of people everywhere. Guess what? Here it is 35 years later — that Reality has come true. Jack Kirby’s Lord of Light drawings, all products of our mutual design, are a phenomenal testament to everything we wanted to do! We couldn’t ask for a better body of a work for the long overdue debut of Jack Kirby in Heavy Metal. As a tip of the cap to one of my favorite artists and the era of the early 1970’s, I wanted to kick off our year long prints program at Comic Con with a blacklight rendition as psychedelic as the story itself. You can find more at Heavy Metal’s website, where preorders for the prints will go live at 7am PDT/10am EDT on Monday, June 22nd.